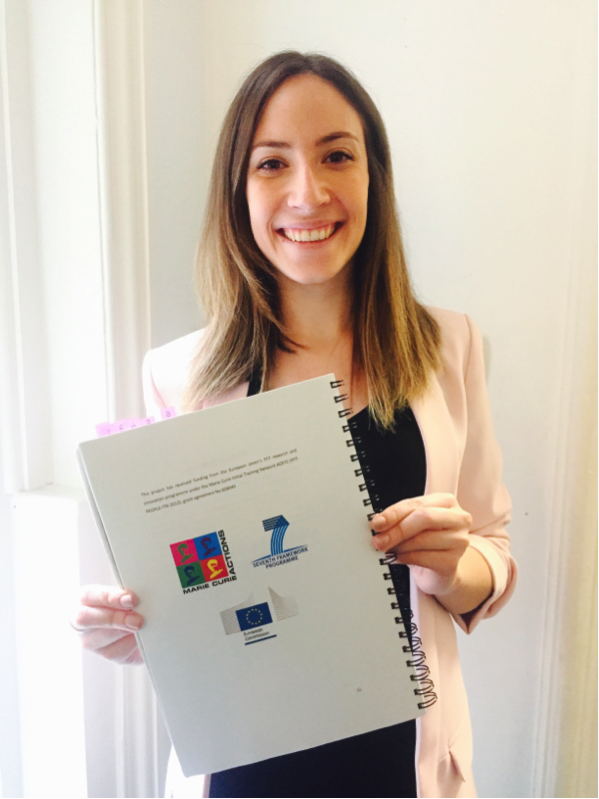 Alejandra Consejo, Early Stage Researcher of the Ageye Marie Curie ITN has recently been awarded the EYRA (European Young Researcher’s Award), sponsored by EuroScience. 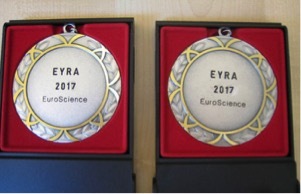 EYRA 2017 is to recognize PhD graduates who defended their PhD in 2017 who, in words of the organization, ‘have demonstrated an outstanding research performance, leadership and outreach and have incorporated a clear European dimension in their research’. The International Selection Committee for the European Young Researchers’ Award 2017 appointed Alejandra as a co-winner of this year edition. The prize-giving-ceremony will be held in July 2018 at the EuroScience Open Forum (ESOF) in Toulouse. 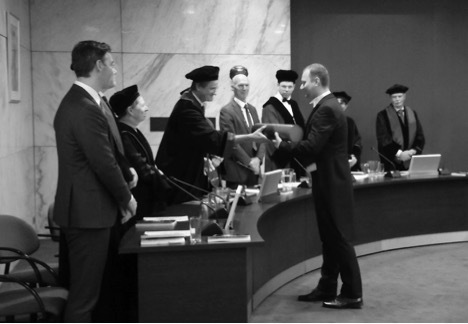 Grzegorz Łabuz, Early Stage Researcher of the AGEYE Marie Curie ITN has defended his PhD at Erasmus University Rotterdam, the Netherlands. His research project is entitled “Intraocular scattering through different optical designs” and was carried out under the supervision of Dr. Thomas van den Berg, Dr. Nicolaas Reus, Prof. Jan van Meurs, Prof. Norberto López-Gil, and Dr. Fernando Vargas-Martín. The main objective of this project was to measure optical quality (both in vivo and in vitro) of different optical designs, with a focus on intraocular and contact lenses, and to determine sources of increased intraocular scatter in pseudophakic eyes. This scientific work has been possible thanks to the Ageye Marie Curie Initial Training Network funded by the European Commission (FP7-PEOPLE-ITN-2013-608049). 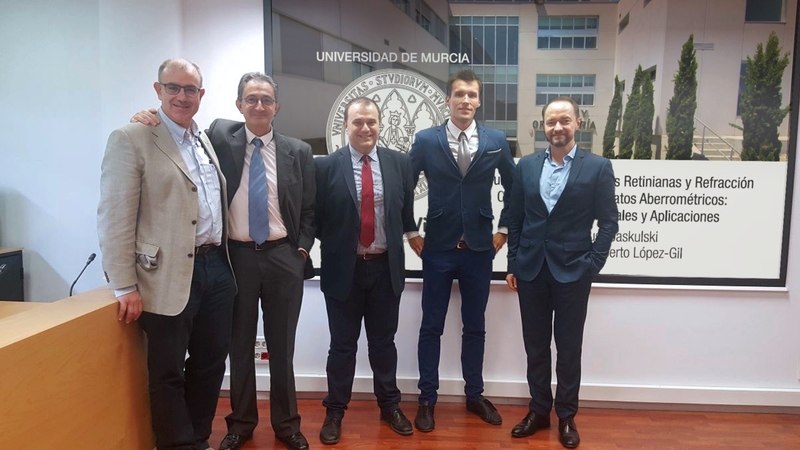 Mateusz Jaskulski, Early Stage Researcher of the AGEYE Marie Curie ITN has recently defended his PhD at the University of Murcia, Spain. His research project is entitled “Objective refraction” was carried out under the supervision of Prof. Norberto López-Gil. His work has resulted in the development of a new tool to calculate and evaluate polychromatic simulated retinal images from aberrometric data, as well as valuable insight into the topics of image quality metrics, depth-of-field during accommodation and evaluation of vision quality after IOL implantation in presbyopic eyes. A new objective refraction metric was developed and validated. The formula was obtained by means of fitting an equivalent sphere to the measured wavefront to the center, and two points equidistant from the center. It allows clinicians to obtain an accurate clinical spherical equivalent value without rescaling/refitting of the wavefront coefficients. Irene Sisó Fuertes, Early Stage Researcher of the AGEYE Marie Curie ITN has defended her PhD at the University of Manchester, United Kingdom. Her research project is entitled “Age-related changes in the optics of human eye with accommodation” and was carried out under the supervision of Dr. Hema Radhakrishnan. This research aimed to explore further what are the changes produced during accommodation and ageing that affect vision as may potentially contribute to the development and improvement of therapeutic, external and surgical solutions capable of restoring the visual function in an adult eye. 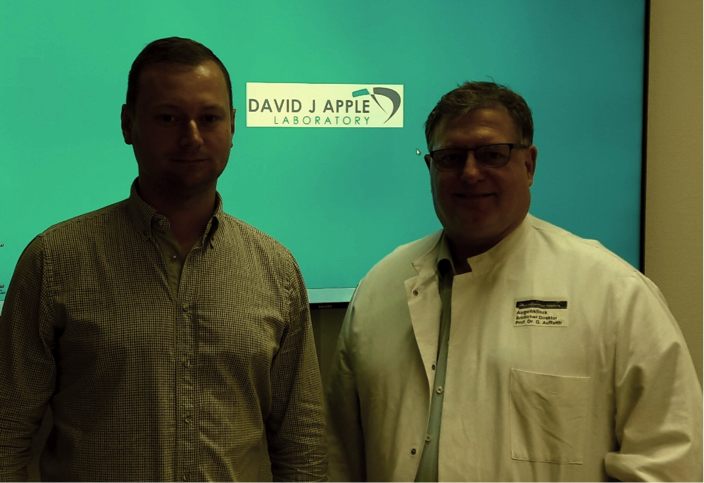 Grzegorz Labuz, an Early Stage Researcher of the Ageye Marie Curie ITN project, after completing his study at the Rotterdam Ophthalmic Institute has moved to Heidelberg to continue the intraocular-lens research at the David J Apple International Laboratory for Ocular Pathology. Grzegorz now applies his scientific experience, which he gained through participating in the Ageye Marie Curie ITN training program, to study the optical performance of new lenses and to investigate intraocular-lens complications. The laboratory is part of the University of Heidelberg with Prof. Auffarth as a team leader and Chairman at the Department of Ophthalmology at Heidelberg University Hospital.